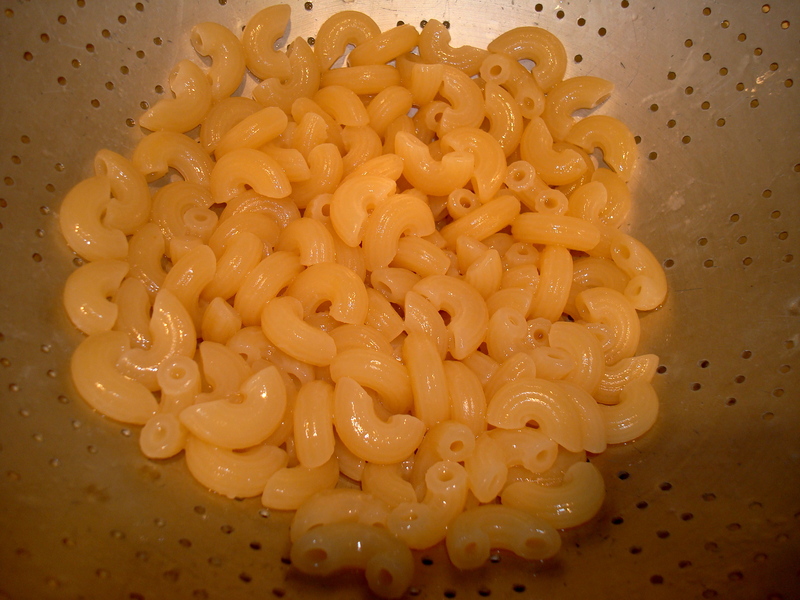 Surprisingly al dente gluten-free macaroni, from bionaturae. A wise person once said, “I’d be dead without bread,” and normally I’d have to agree. Except I’ve basically gone without bread (and other wheat products) for more than a week now. This has not been easy. I’m about as omnivorous as they come. In fact, it’s nearly impossible for me to name a food I don’t like. Tongue, Brussels sprouts, turnips, chopped liver, you name it: bring them on. Well, maybe I don’t love tripe. Nor have I ever really dieted. I would rather exercise more than go without. But my sister has been nagging me for a year now to give up gluten for a week. She doesn’t have celiac disease, but she’s had more energy, been less irritable and more sated after a meal when she goes wheat-free. Apparently, going without gluten improves attention span and counteracts ADHD, traits of which I’ve been known to exhibit. So I finally agreed to take the plunge while visiting Elaine in Atlanta. A week and a half in, I do feel less bloated and a bit sharper, but that’s probably because I’m eating fewer food-coma inducing carbs. I may be starting to shed some holiday weight (but that could be the additional Pilates and Bollywood dancing classes I’m taking). Lack of gluten does seem to change things gastro-intestinally, for the better. And when I violated the diet to have a store sample of bread, a few sips of beer and French onion soup with a little flour in it, I did feel a bit light-headed. Not sure how much longer I’ll continue the experiment, but it’s nice to have this baseline. I’m really craving baked goods and more than anything, beer. Hard cider and the gluten-free stuff don’t cut it (I drank both this week). The pasta wasn’t half-bad, though. And I love quinoa. We made a lovely quinoa with shitake mushrooms and leeks risotto from the Flying Apron’s Gluten-Free and Vegan Baking Book I gave Elaine. I might try to do gluten-lite. It is nice to have something to force you not to eat the bread at the restaurant. Once you have a bite, it’s hard to stop. Hi Laura! Your post is right up my alley. I have been gluten-free for 14 days and am doing this for a month – trying it out for the many reasons you listed. Breakfast is my biggest challenge as I usually eat at work so I need something easy but also something filling. I am a big fan of greek yogurt but it’s getting kind of old; yes a hard boil egg is an option but what can I eat along with it? I tried some gluten-free bars from Whole Foods and they were NASTY. I welcome your suggestions! Like you, I think the solution for me moving forward is gluten-lite. Margaret! Great to hear from you. Well you outlasted me!I broke down with some homemade bread and a cookie at lunch today. But I’m going to keep gluten-lite going. Let’s see: I really recommend quinoa. I’ve made couscous-like salads with it and I even hear of folks that eat it like a hot cereal. I’ve been having rice cakes for breakfast with hazelnut butter (almond or peanut butter would work, too). And even before trying gluten-free, I loved Lara bars, which are just dried fruit (mostly dates) and nuts. I’ve found some good gluten-free granolas out there. And then oatmeal of course (And grits)! And since you aren’t celiac you wouldn’t have to worry if oats processed in a facility with wheat. Great tips Laura! I am heading to the grocery store today and plan to try out your suggestions. Thank you! !